As Norway’s initial mourning period comes to a close, Norwegian media have begun criticizing various police agencies for their response to the Oslo bombing and Utøya shootings. New details are also emerging about boat problems, the lack of availability of a helicopter and issues encountered in the post-crisis command structure. The head of the local police district around Utøya, Sissel Hammer, had previously told newspaper Dagsavisen that the stopping and switching of boats alone had cost the mission 10 minutes. Chief of staff Fredriksen described comments that a quicker route could have been taken as “speculation” when speaking to NRK, adding that “the optimal solution is seldom available and we must chose from what it possible.” He has referred such issues to the forthcoming commission into the handling of the terrorist attacks, which was announced by Prime Minister Jens Stoltenberg shortly after the events. However, he described the police as “improvising in a very good way” when the original boat broke down. The fact that the one police helicopter was not used to access Utøya has also been under the spotlight. Chief of staff Fredriksen told broadcaster TV2 that the police are “very much in doubt” that the use of a helicopter would have made any difference. Nonetheless, some of newspaper Dagsavisen‘s police sources say they have been prohibited from going on the record about their criticisms. Police terror drills, carried out annually, have usually given the police helicopter, equipped with snipers, a central role in similar scenarios to those that actually took place at Utøya. On 22 July, the police were apparently unclear whether they could use the helicopter, with Fredriksen telling TV2 that at the time “it was ‘the health track’ that had the responsibility for this helicopter, and not the police.” Helicopter crew personnel reportedly began asking the police leadership if they were needed from just 15 minutes after the bombing in Oslo, but were told they were not. Only 33 minutes after Breivik was arrested on Utøya were they called into service, TV2 claims. It has previously been reported that many trained helicopter personnel were on leave during the attacks. Oslo police have further admitted that aspects of their response systems did not work as planned during the attacks. The Utrykningsenheten (UEH), which consists of officers in ordinary service that have special crisis competencies, was not fully mobilized because its members did not receive messages from central command, with only those officers already in service immediately available. An overload of the police’s systems after the attack began meant that extra officers had to be phoned manually. 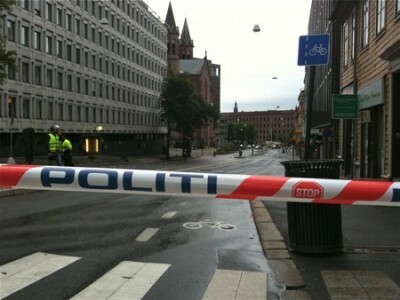 This is blamed for the fact that the parliament buildings were not secured until one hour after the bomb went off in the government quarter, although chief of staff Fredriksen stated to NRK that “cutting edge” national emergency response units are based in the capital and were used during the attacks, meaning the UEH would have had a different role. Some UEH were already on duty in Oslo and utilized where necessary, Fredriksen confirmed. The leader of the Norwegian Bar Association’s public security committee, Arild Humlen, commented to Dagsavisen that it is “completely obvious that there is a weakness” in PST’s monitoring of far right extremism, adding that he “could not comprehend or understand” why better surveillance had not been in place. In particular, he highlighted Breivik’s ability to buy large quantities of potentially explosive fertilizers as “remarkable” and something that “shows that the PST leader does not have control of this area.” Kristiansen had previously told NRK that the organization could not legally place Breivik’s name on their watch list just because he had bought large amounts of fertilizer, stressing that they “had absolutely nothing on Breivik” because he had “lived unbelievably law-abidingly.” Terror researchers at both the Swedish Defense Research Agency and its Norwegian equivalent that spoke to NRK supported the PST’s view that the attacks were difficult to predict. Humlen was nonetheless unimpressed, stating that the organization should be more self-critical in the aftermath of the attacks.